This brightly colored 4th of July Puzzle has 20-pieces and sits in a 11" wide by 15" high frame. Pri..
We took the favorite NameTrain vehicles and created a Busy Highway! This brightly colored 20-piece p.. This brightly colored Christmas Puzzle has 20-pieces and sits in a 11" wide by 15" high frame. Print..
We took our Maple Landmark animal characters, buildings and trains and combined them to create this .. This brightly colored Duck Pond Puzzle has 20-pieces and sits in a 15" wide by 11" high frame. Print.. This brightly colored 6-piece puzzle measures 11" X 15". Six colorfully captured prehistoric animals.. This brightly colored 6-piece puzzle measures 11" X 15". Six colorfully captured typical leaves are ..
Our graphic designer created some fun animal characters make this Noah's Ark puzzle. This brightly c.. This brightly colored 8-piece puzzle measures 11" X 15". Eight beautifully captured typical backyard.. This brightly colored 15-piece puzzle sits in a 11" x 15" frame. Printed image won't scrape off with..
One of our new shaped puzzles for 2013 - An American Flag. The flag has 15 large interlocking pieces..
Our Bulldozer puzzle has 12 large interlocking pieces cut from 1/8" hardwood plywood. 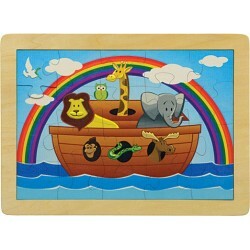 Each puzzle me..
Our Dinosaur puzzle has 11 large interlocking pieces cut from 1/8" hardwood plywood. Each puzzle mea..
Our earth puzzle has 12 large interlocking pieces cut from 1/8" hardwood plywood. The earth puzzle m..
Our Elephant puzzle has 10 large interlocking pieces cut from 1/8" hardwood plywood. Each puzzle mea..